French unemployment rose to 10.8% in the first quarter of the year - its highest level since 1998, official estimates have shown. The jobless rate grew from 10.5% in the last quarter of 2012, the official Insee statistics agency said. The French economy went into a recession after seeing GDP fall by 0.2% in the first quarter. 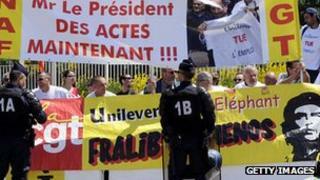 President Francois Hollande has pledged to boost jobs and growth, but demand has been sapped by the eurozone crisis. According to Eurostat, the European statistics agency, which uses a slightly different measure, the jobless rate has already reached 11%. The figures came as the European Central Bank (ECB) prepared to meet later, when it is expected to maintain its benchmark interest rate at 0.5%. There has been speculation that the central bank will unveil plans to revive lending in the eurozone, especially for small and medium-sized businesses (SMEs). SMEs provide around three quarters of jobs in the eurozone. The International Monetary Fund earlier this week warned that France needed to introduce fresh economic reforms or else risk lagging behind some of its European neighbours. It called on France to lower its labour costs and halt tax increases to boost both growth and its competitiveness. In its annual assessment, the IMF also forecast France's economy would contract slightly more than it previously thought. It said GDP would fall 0.2% this year and predicted economic growth of 0.8% in 2014.